NO END TO THE MADNESS! With the invisible finishing line in sight, one might be inclined to think things were winding down at the Boutique Hostal Salinas and its various spin off hot spots. Not so – in fact, the Salinas Trio seem to have no intentions of calling it a day or a night with plans already being put into place for the winter months. So, just the one more to go then and that’s for the We Love… Closing Party on 29 Sept, when Lo Cura Lounge will be welcoming Simon Rigg, owner of Phonica Records (world renowned record shop of God-like status in Soho), a place frequented by every smokin’ hot name in the business ever- plus J.G. Wilkes, one half of Optimo, the legendary Glaswegian DJ duo whose style runs along a Andrew Wetherall, Ivan Smagghe, Trevor Jackson type of vibe. These dudes are the ultimate experts in tracing the lineage between 80’s New Wave, Punk, Rockabilly, Dub, Disco, Techno, Indie, Film Noir and the list goes on…. We say Très Bien to Bruno From Ibiza, Angel Cielo and Julien Tax who have waved their Sunshine People flag proudly at the Boutique Hostal Salinas over the summer months. With only two more fêtes a la Francaise before they bid us à bientôt and skip off into the Salinas Sunset, we plan to eat, drink and be merry- BBQ + Cocktails+ Dancing. In that order. 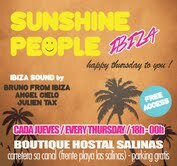 If there was ever an ideal location for a Sunday Night Market, it is surely the Boutique Hostal Salinas. ‘Once Upon a Time’ takes place bi-monthly in and around the grounds of the BHS, combining vintage fashion with contemporary hand made pieces, colourful kaftans and kooky headwear plus much, much more- a little fashionlandia run by a trio of Italianas who know a good thing when they see it. 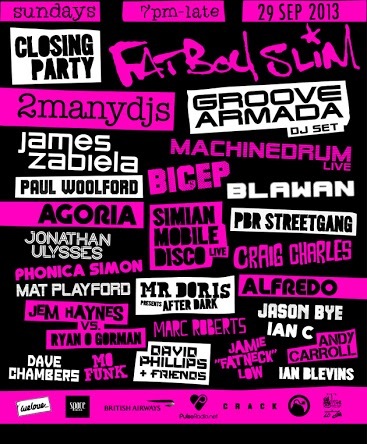 The Bad News- Sunday 22 Sept sees the last gathering of the Once Upon a Timers for this summer. The Good News- We can confirm that the Sunday Market will continue through the winter months! More details as we get them! Boutique Hostal Salinas has earned itself a bit of a worthy reputation over the last couple of years as being one of the unmissable pit stops on the island’s Halloween Route. Whilst details are invariably sketchy at this point, rest assured the stops will be pulled out to pull up a hairy monster of a celebration of the dead and the back from the dead. For those of you who still haven’t sampled the culinary delights on offer at Restaurant Hostal Salinas, those kind people behind the operation- David Phillips, Duesi Wolfmeir and Anita Dey not to mention Chef Dani Gastalver- have a little end-of-season offer for the foodies amongst you. Two, actually. The bar that brought us all together- Bar Lo Cura, run by the same BHS crew, continues to open Mon-Sat from 11-3/3.30 with weekly guests Karlos Sense (Thurs), Daisy Heartbreaker(Fri) and Ian Blevins(Sat) keeping things nicely ticking over in between times. September 16, 2013. Tags: Bar Lo Cura, BHS, El Salon, halloween, Lo Cura Lounge, market, Once Upon a Time, restaurant, Space Ibiza, Sunshine People, We Love. Uncategorized. Leave a comment. 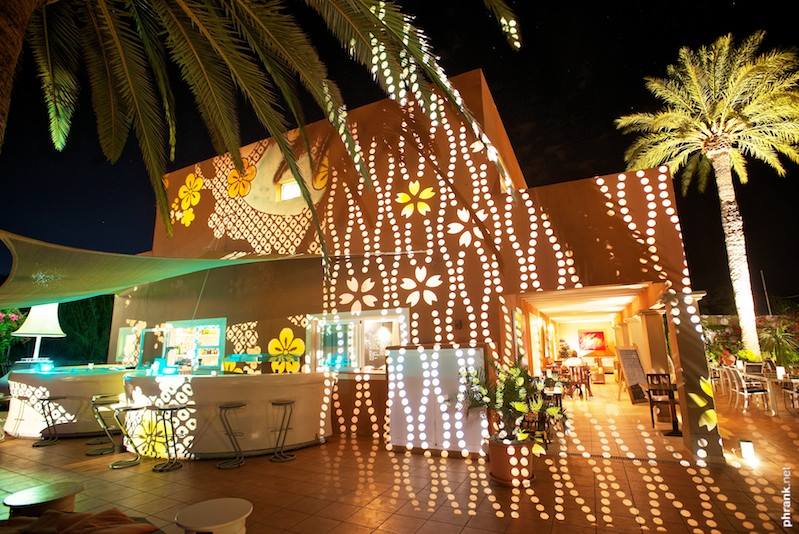 BOUTIQUE HOSTAL SALINAS- WELL WORTH ITS SALT! 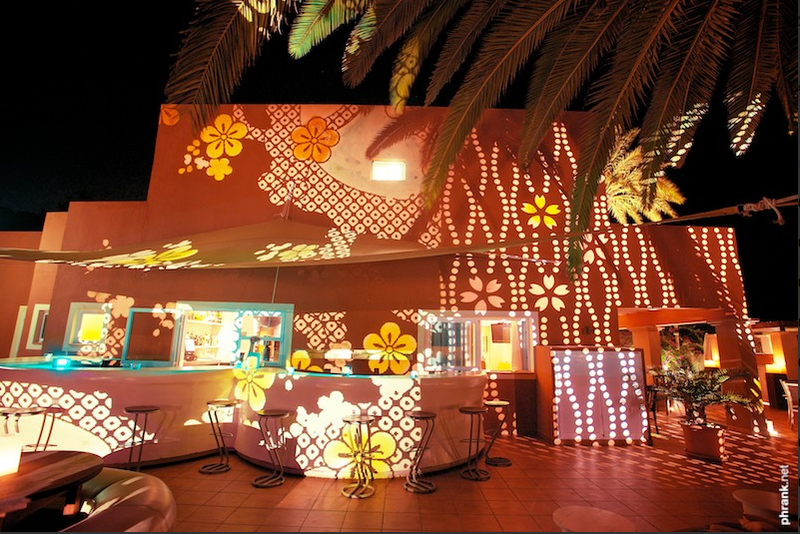 As Ibiza hot spots go, BOUTIQUE HOSTAL SALINAS is certainly proving to be a top contender here on the island of crazy dreams this summer. 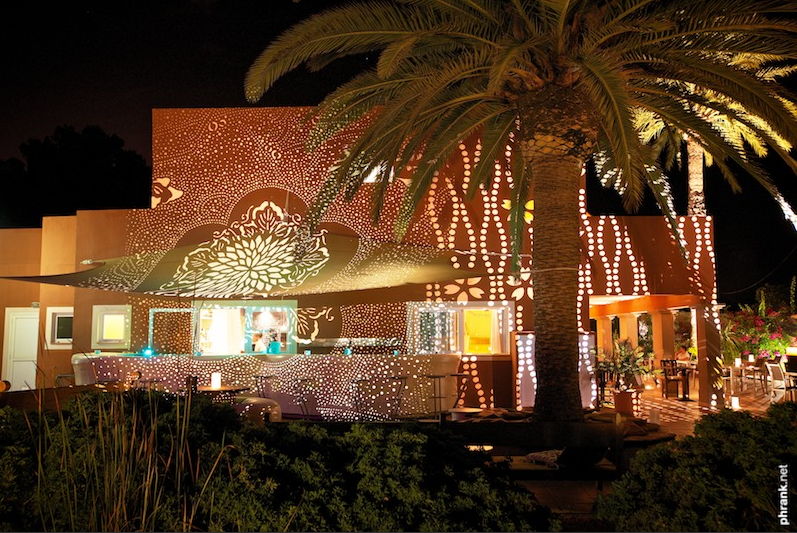 The 12 room hotel, only metres away from the shores of the world famous Salinas Beach, having raised its own bar even more this season, has proved itself on the Ibiza map as not only as an excellent choice for an idyllic holiday getaway, private party location and also as a highly successful restaurant in its own right. And that’s before we even mention the events programme…. 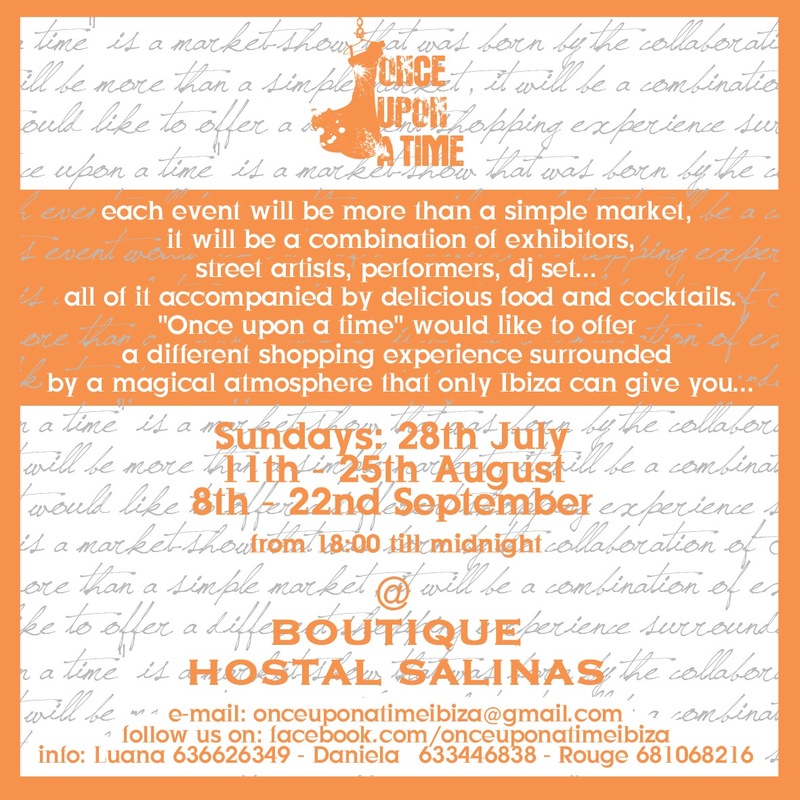 Surely the surprise star of the BHS summer, the bi-monthly Sunday Market which goes under the name of ‘Once Upon a Time’ has gone from strength to strength over the last weeks, fast becoming the coolest night market on the island of Ibiza. Organised by trio of Italianas Daniela Natale, Luana Biondi and Rouge Le Dangerouge, all familiar faces on the Ibiza scene, Once Upon a Time is the new market of choice round these parts, perhaps because it turns the regular notion of ‘market’ right on its head, presenting instead an absolute melting pot of creativity- a mixture of young designers, vintage vendors, street artists, theatrical performers, illustrators, DJs and Ibiza’s coolest hepcats, all milling around the grounds of the BHS and creating an Ibiza shopping experience with a major difference. Starting at 6pm on its respective Sundays, the Boutique Hostal Salinas undergoes a time-travelling transformation that every vintage lover worth her salt would surely die with her leg in the air to attend. This is what we like to refer to as a real mooching opportunity- quality stalls of all shapes and sizes, price ranges to match, all sprawled across the grounds of Salinas’ cutest hotel and we jest you not; for those with an eye for this kind of thing, you just got lucky. Providing the Shopping Soundtrack, DJ Daisy Heartbreaker is on hand playing a selection of her finest vintage vinyls- tunes from the past and the present to help ease you into shopping mode. To build up your strength for the mahoosive task in hand, grab a freshly made fajita along the way or do it in style and ask for the A la Carte Menu before you dive into vintage heaven. Bruno from Ibiza is a DJ who barely needs an introduction round these parts. As former resident DJ at the world famous Café del Mar back in its wey-hey-hey-day, Bruno went on to make a definitive mark on the musical history of Ibiza and has been a constant fixture on its scene ever since, taking his skills worldwide and representing the real essence of the island with every step of his musical journey, Back to the present and its our pleasure to present Bruno, his sound and his style at the Boutique Hostal Salinas, who together with Angel Cielo and Julien Tax stepping up to complete the DJ trio every Thursday from 6pm, presents a soundtrack that clearly evokes feelings of the authentic Ibiza keeping a very enthusiastic crowd entertained till the wee small hours. They’re back! One of our favourite musical duos has returned to the island for even more fun, this time throwing their very own bash at the BHS on 4 Sept from 4pm till the last man falls. Roping in DJ Callum (DJ, producer, head of House of De Bango, Messalina, Par-Tay, Cellophane, Space Truckin’, Wildlife. Resident at We Love…Space Ibiza, Carl Cox @ Space) to give them a hand, Amp & Deck (aka Kev Macey + Joe Lye + Blaine Harrison (Mystery Jets)) fully intend to milk the fact that this is their last appearance in Ibiza this summer, to which end, anything could happen and probably will. Expect a healthy dose of absolute awesomeness there for the taking. Plug yourself in, why don’t you? Kev and Joe Lye swung by Boutique Hostel Salinas to play sets in July of this year, having previously warmed up for island ledge, Alfredo. Fresh from their second set of the year for Lo Cura Lounge at ‘WE LOVE’ SPACE on Sundays the boys wanted to throw a more chilled “Balearic” (if you will!) party on the Island. 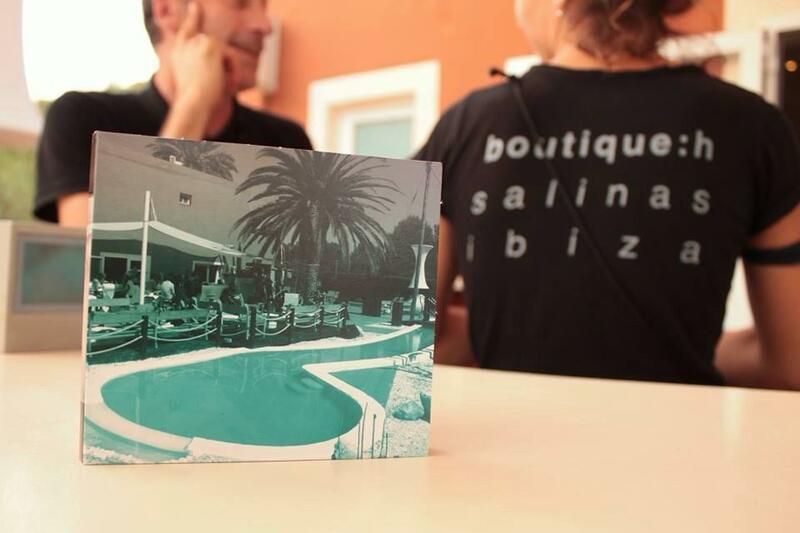 In a one off special, Boutique Hostal Salinas are proud as punch to play host to The Pool Agency and their chosen representatives on Saturday 24 August. Starting from 5pm, Pool DJs Matty J and Ben Terry will be joined by KENNETH BAGER (Music for Dreams), SEAN BROSNAN (Needwant/Futuredisco), JAIME FIORITO (Heritage Project) and BIG.L (We Love) for what is shaping up to be a very valid excuse to get your freak on. In keeping with the theme, guests are encouraged to bring their bathing suits for a dip in the Boutique Hostal Salinas actual pool. Originally from Dusseldorf, photographer Frank Weyrauther (Phrank) is a very familiar face on the Ibiza scene, having worked his magic here since the 90s and providing a very visual and accurate image of what Ibiza is all about. 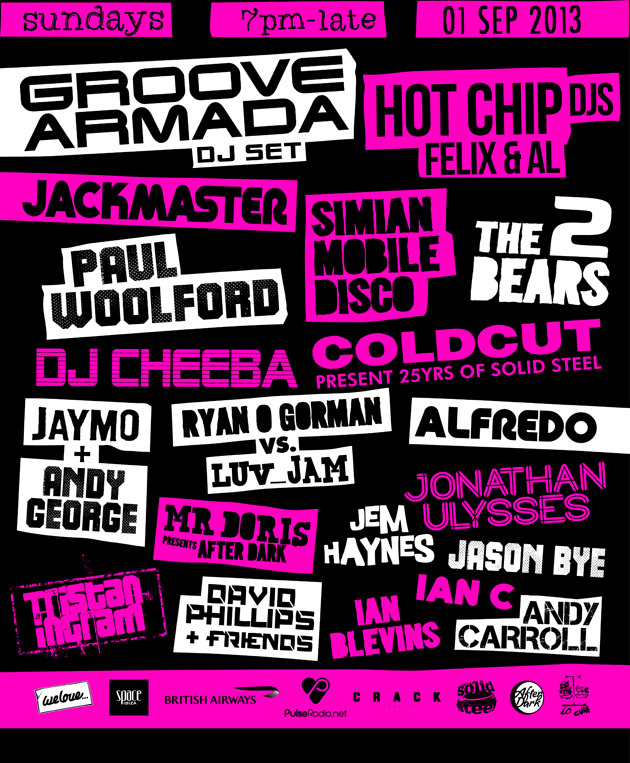 In particular, he is renowned on the club scene, working over the years for surely, some of the most reputable promoters and clubs on the island- amongst them Manumission, Cocoon, We Love, Amnesia, Space, Privilege. And now, it’s time for Phrank to show us some some of the thousands of images he has in his hard drive. Coinciding with his birthday celebrations, the Vernissage of Phrank’s exhibition takes place on 30 Aug with canapés, cocktails and vinyl only sessions from Alfredo and Jaime Fiorito, with more surprises yet to be announced. Word continues to spread across the island that the BHS Restaurant is well worth a visit, with chef Dani Gastalver wowing diners with his A la Carte Menu on a daily basis. Amongst guests recently spotted in the restaurant, Strictly Come Dancing’s Jason Gardiner who, we are reliably informed cleaned his plate and then some. Enigma’s Michael Cretu, Germany’s biggest female pop star, Sandra plus the best part of the electronic music industry massive are all also big fans of the BHS Restaurant. BHS Restaurant opens daily from 2.30pm-11pm with a Daily Menu as well as the A la Carte Menu. When they are not running the Boutique Hostal Salinas, David Phillips, Duesi Wolfmeir and Anita Dey keep themselves amused with their sister project- Bar Lo Cura in Ibiza Port and its spin off- Lo Cura Lounge, which pops up at We Love…Space every other Sunday. August 19, 2013. Tags: Alfredo, Amp & Deck, Boutique Hostal Salinas, Bruno from Ibiza, ibiza, lo cura, Lo Cura Lounge, Once Upon a Time, Phrank, Space Ibiza, the Pool Agency, We Love. Uncategorized. Leave a comment. LO CURA LOUNGE ha sabido acoger el carácter gamberro del pequeño bar del puerto, LO CURA, y la personalidad del HOSTAL BOUTIQUE SALINAS, la finca payesa con 11 habitaciones detrás de la playa más famosa de la isla. Fue precisamente en esta ubicación donde sus propietarios Düsi Wolfmeir, David Phillips y Anita Dey concibieron LO CURA LOUNGE, una serie de sesiones festivas que además de en el propio hotel, suceden, a todo volumen, y desde el próximo 9 de junio en la noche estrella del calendario estival de Ibiza. Sí, WE LOVE. Los Domingos. Space Ibiza. El espacio de LO CURA LOUNGE en WE LOVE es El Salón. La habitación más privada de toda la discoteca donde se encuentran los conocidos, los amigos y los que entran nuevos. Como en casa. 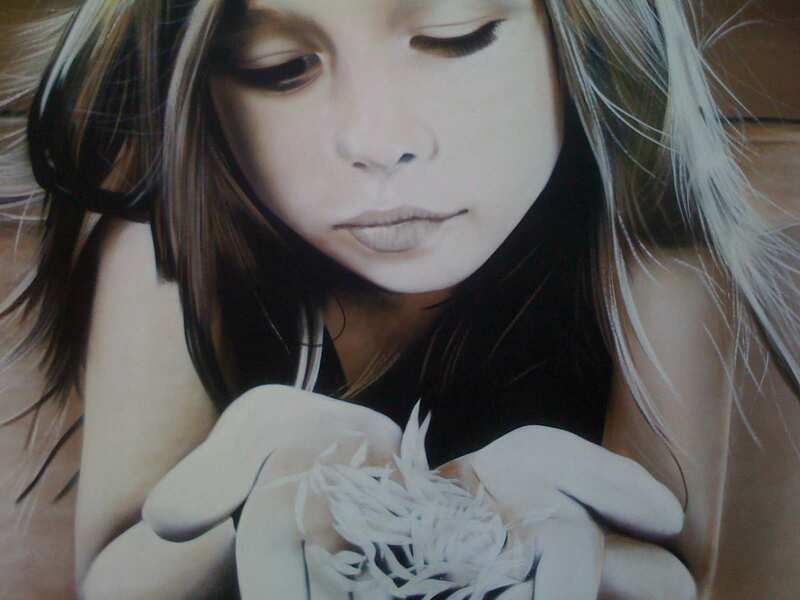 Existe en LO CURA LOUNGE un sentimiento simple pero profundo sobre la música. Si mola, se escucha. Disco, Electro, West Coast, Tech House, Hip Hop… De todo y por supuesto todos, bienvenidos. Encuéntranos quincenalmente, los domingos desde el 9 de junio y hasta el 29 de septiembre en Space Ibiza. Twisted Ace & Stray Kitten regresan a una de sus cabinas preferidas para otra apasionante sesión de música de las décadas de los 40, 50 y 60. Rock n Roll, Swing, Jazz, Country… Como atrezzo, Trash Tienda, el proyecto online integrado en Facebook que sale a la calle con un mercadillo de prendas seleccionadas nuevas o semi-nuevas y una gran colección de calzado. Una reinvención de los mercadillos tradicionales para convertirlo en toda una fiesta. Un espacio donde no sólo se vende sino donde además se comparten ideas y propuestas genuinas, con deliciosos cócteles y buena comida. 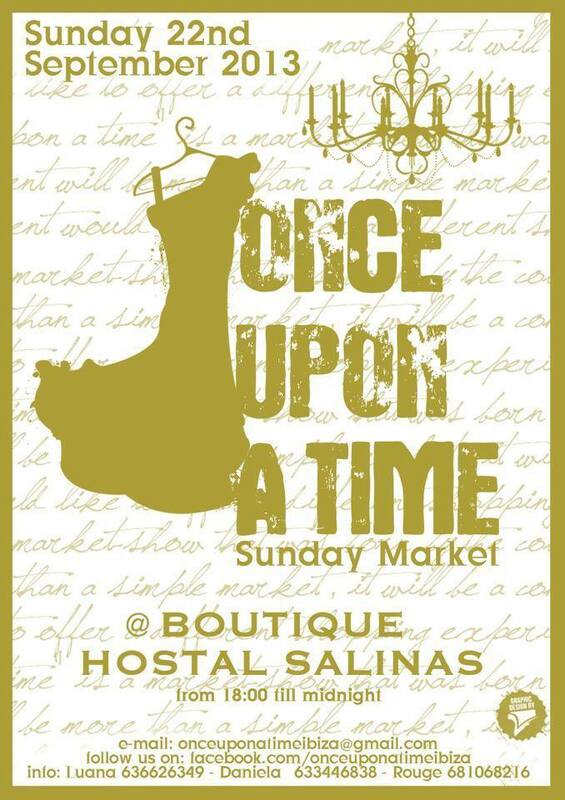 Once Upon a Time arranca en el Hostal Boutique Salinas el próximo domingo 30 de junio. June 6, 2013. Tags: Boutique Hostal Salinas, DJ's, ibiza, JitterBug, Lo Cura Lounge, musica, NuNorthern Soul, Once Upon a Time, Phat Phil Cooper, Restaurante, Space, Trash-Tienda, We Love. Uncategorized. Leave a comment.